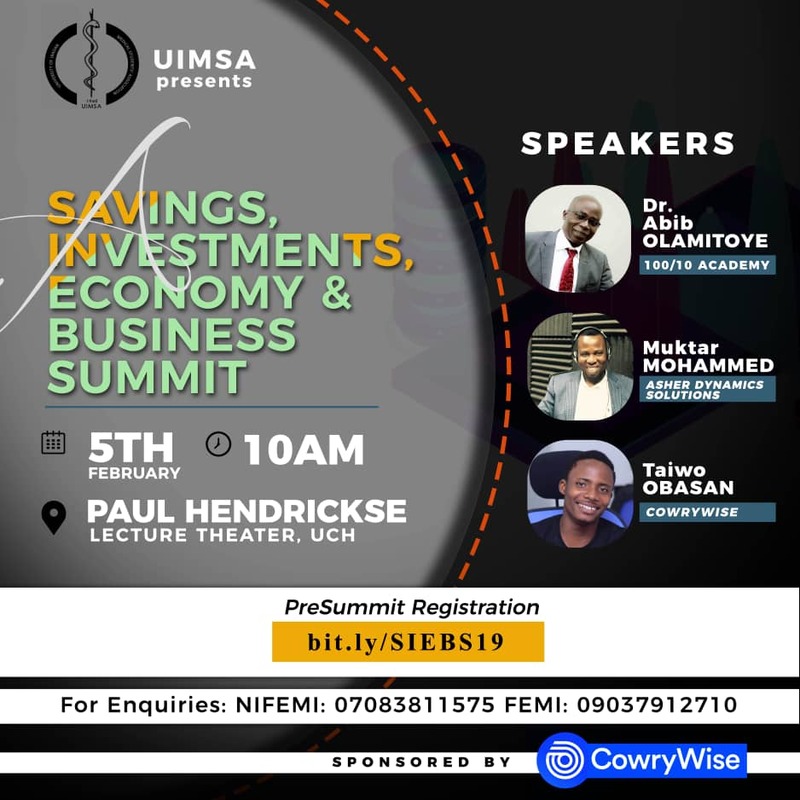 The highly anticipated University of Ibadan Medical Students’ Association’s (UIMSA) Savings, Investment, Economy and Business (SIEB) Summit was held on the 5th of February 2019, at the Paul Hendrickse lecture theatre, UCH. The programme which was scheduled to start at 10am began officially at about 10:56am, with two of the speakers present namely; Dr Abib Olamitoye and Muktar Mohammed. The interactive session was moderated by Atere Semiloore, a 300 level medical student of the University of Ibadan. Moderator: Would you please share with us the importance of mentorship? Dr. Abib Olamitoye: I want to congratulate UIMSAITES. When I was a medical student in ABH, I was very poor. Therefore, there is a lot you can gain by listening to people who have been there. Moderator: As an international finance analyst, how can I manage finances as a medical student? Muktar Mohammed; First, you need to create a system that works for you. You also need to create a savings system, have a savings plan. A savings plan helps you make use of opportunities when it arises. As medical students, you must try to save money no matter how small it may be. You must think of the vehicle of savings you want to use. You must also learn how to accept that you can lose money in order to earn money. You must have a savings plan, investment plan and an enjoyment plan. 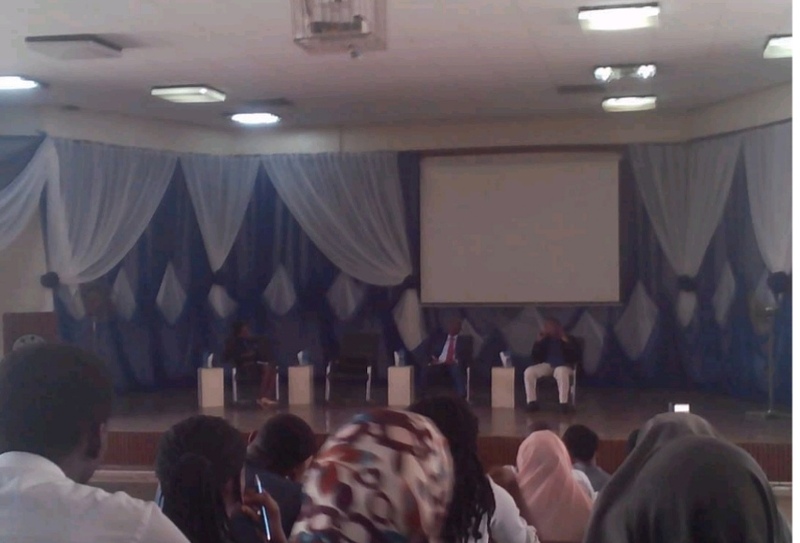 From left to right: The moderator, Atere Semiloore, the speakers, Dr Abib Olamitoye, Muktar Mohammed. Moderator: Is it ideal for youths to go into Ponzi scheme? Muktar Mohammed: Any investment that you cannot exit whenever you want to, you should not go into. It is good to “hammer” in Ponzi schemes but the issue is the sustainability of the “hammer”. The 3rd speaker, Taiwo Obasan came in at about the end of the programme and exposed to us the importance of saving with cowries. Dr. Abib Olamitoye, in his usual generous and fatherly gesture, said that his books will be available to UIMSAITES at ABH at a discount of 20 percent for all those who want to purchase them between the day and 9th of February, 2018. As such, UIMSAites are enjoined to make use of this opportunity to purchase and read the books by Dr Abib Olamitoye, at a cheaper rate. Refreshment was also served towards the end of the programme. Although the SIEB Summit by UIMSA was not attended by as much UIMSITES as was expected, it was definitely worth the hype, as a lot was learnt by the young enterpreneuring UIMSAites present. Speaking to some UIMSAites who didn’t attend the summit, most complained about the timing and affirmed they would have attended if it was on a weekend. However, a lot of UIMSAites were seen hanging around Dr Abib Olamitoye and the other speakers after the programme, in order to gain more knowledge from their experience. In a positive light, the SIEB Summit by UIMSA for UIMSAITES was indeed a wonderful programme. Kudos!